RAHRC Regatta 2018 - The Highlight of the Sailing Year! ​Sponsored by VOLVO Buses and Trucks. “Never take it for granted what we experience; others wait a lifetime to live what we have.” Joe Bildstein. On the beach, on the water, we joined the party!! This was all made possible by excellent participation and sponsorship from VOLVO BUSES AND TRUCKS (the main sponsors), OIG African and Eastern and RAHRC. Around 200 participants made up 11 teams, and sailors raced on Hobies continually for 2 days in a series of pursuit races. 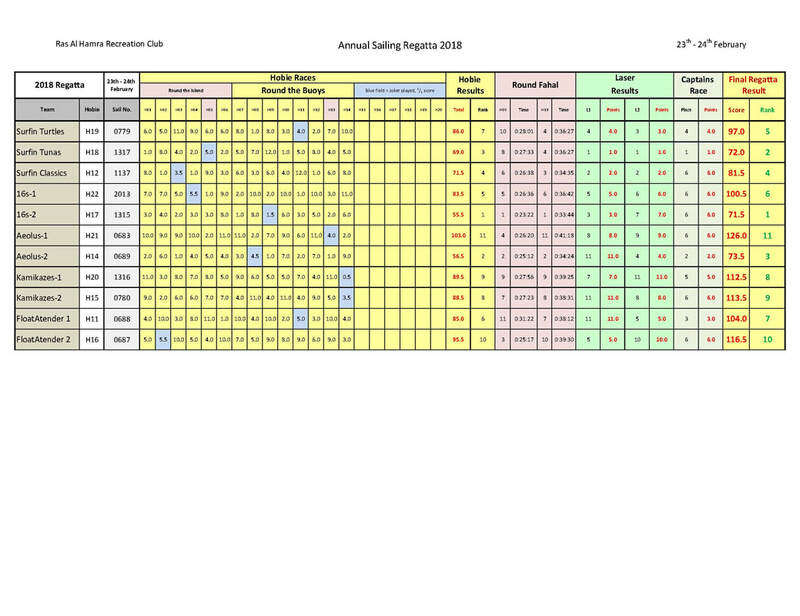 These results along with 4 laser races, 2 round the island races and the Captains race made up the final overall result. Separate sailing events included windsurfing and approx. 20 sailors under 16 in toppers. It was great to see new team initiatives growing and old teams reinvented, switched round and/or injected with new and budding talent creating great competition on the water. The competition was extremely close and the leader changed throughout the 2 days making for an exciting weekend, every team with their successes and challenges! Innovative new beach activities like Rasjenga and Beach Bowling were added to the traditional volleyball, petanque, and sand castle building competition for fun for all the family, keeping people entertained on the beach during the day. Evening dinner, drinks, DJ, band and dancing kept the party going. “Aeolus The Mighty was gracious to us and granted us plenty of his joyful fruit; wind on that weekend, against all odds. It was a great day to feel alive and enjoy wind, waves, speed, people, teamwork, music, food, and meet "old" friends who returned to worship the God of Wind. Some of the returnees never lost their touch with managing the wind and showed us again how to do it (Tony, Klaus....). It was great to see good and fair competition, on the water and on the beach and nice to see people helping each other when help was needed. Never take it for granted what we experience, others wait a lifetime to live what we have." "Amazing wind, great sailing, teamwork and sportsmanship! It was especially promising to see more F16s YOUNG SAILORS on the water doing so well and inspiring each other in toppers, windsurfers and hobies. We all –children and adults - loved the new beach games and different new events too. A special thanks to OOD Stephen Martin, I really do not know how the regatta could happen without Stephen who not only worked all weekend, but pulled the whole regatta organisation together along with a new committee and all below, getting the job done as always so efficiently and selflessly. This was a huge, wonderfully nostalgic event made unique by the presence of a mixture of friends old and new. Saturday evening was particularly special! We MUST keep the REGATTA TRADITIONS alive forever - especially fancy dress and maple bacon popcorn !!!" "A great highlight of the sailing year for sure! One friendly Classic whose 17th Regatta it was, mentioned that this was the second best due to the excellent wind conditions we had! The organization of the event sadly had to deal with the unavoidable and unfortunate absence of some key members including its Commodore, and it was good to see that a number of people stepped up to fill the gaps (especially Stephen Martin, Craig McMeekin, Sarah Salt and Jenna, Joe Bildstein,). A massive sigh of sympathy from the crowd celebrating Dave Clark and Victoria's huge contribution over many years to the health of the sailing community at RAHRC and commiserating their departure this April. Unfortunately we had one medical treatment case due to a dangerous condition in a storage area. Apart from that, I am not aware of any sailing or non-sailing incidents, as we want it to be! All in all an excellent weekend of fun. What are we doing next weekend? All local and returning participants for joining this event. from webmasters M.Fritz & V. Grainger and featured writers/photographers - please submit your news to us.